I made this for a large-ish party and I had to wheel and deal the attendees to get 10 sausages to take home and photograph (because of course I forgot to take a pic before we left). 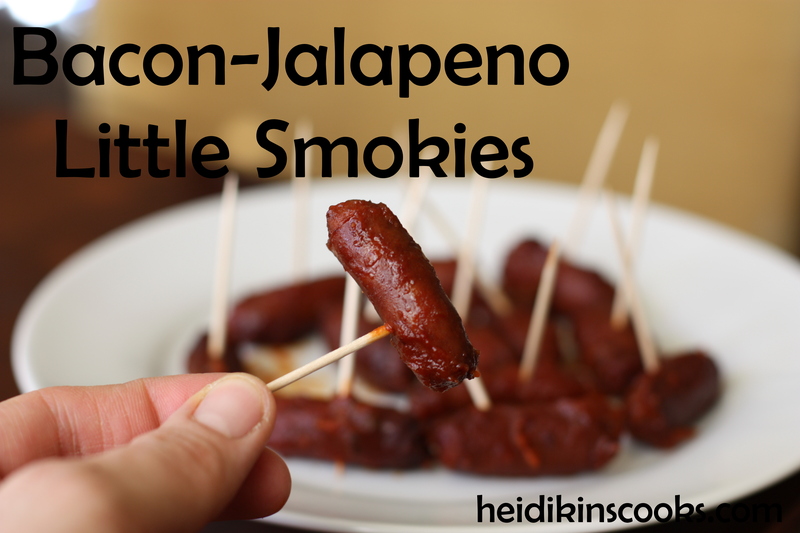 When I looked online for some recipe inspiration it seemed that every Little Smokies recipe was a combination of ketchup, BBQ sauce and grape jelly…which is probably just fine, but I would much rather spend 5 or 10 more minutes and have something really delicious. (Also? I think grape jelly is the WORST! But that’s my personal bias.) I put these in the crock pot all day and they turned out just perfect, so really, 5 minutes wasn’t that big of a deal. You can scale this down for a smaller gathering, these quantities filled my 5 qt crock pot quite nicely without being too full to travel to the festivities. If you’re looking for a way to wow your friends, this recipe is it! Cook your bacon in your preferred method (skillet on the stove, George Foreman Grill, rimmed baking sheet in the oven, whatever). Cook it crispy-crispy because it will sit in sauce for several hours. While it’s cooking chop your jalapeno. Now, I am not a spicy food person. I use fresh jalapenos because I can determine how many seeds I want in the recipe (the seeds are the hot part, the pepper flesh is rather mild). I ALWAYS put on rubber gloves when I handle jalapenos because I don’t want those oils or anything on my fingers to then be transferred to my eye. I cry like a baby when I chop onions, I think I’d probably curl up and die if I got jalapeno oil in my eyeball. If you like things spicy, keep a few of those seeds in the mix. If you just want the jalapeno flavor without the spice, toss all the seeds. Chop and measure and dump all the ingredients into the crock pot and set to high for 4 hours or low for 6-8. You really just need to warm this up and let the flavors get all cozy. Even though we don’t care about football, I love using the Super Bowl as an excuse to eat football food. These are definitely going to be making an appearance at my house on Super Bowl Sunday this year. Yum! Ha! I am in your same boat! I really couldn’t care less about football (or sports in general), but I am all about football food!! !